A pretty resort with chalet-style architecture made up of several small hamlets and the central village of Valmorel - a paradise for beginners and intermediates. 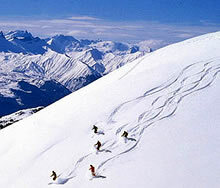 The pistes are mainly aimed at the beginner and intermediate and skiers at this level will love Valmorel. Pistes are spread out across the area and the resort offers 153kms in total - which rivals some of the bigger, better known resorts. Lots of summer mountain activities available and with a car Valmorel is a good bast to explore further afield. traditional still unspoilt Savoyard village, not yet well known amongst foreign tourists. Features a handful of traditional style bars and restaurants.